Bring toddlers’ dreams to life with our exclusive mermaid tail gift set in Celtic Green, featuring a mermaid tail skirt, swim top, plush toy, and Mermaiden Tales book! 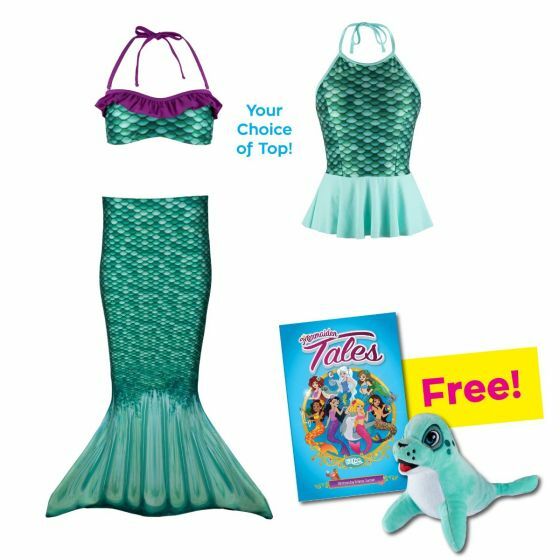 Little girls who dream of life as the classic red-headed mermaid will love this special gift set that’s only available during the holiday season! Toddlers can instantly transform into their favorite mermaid princess the moment they don this mermaid tail skirt and matching swim top featuring scales of mint and emerald green. But the excitement doesn’t stop there! This gift bundle includes our exciting Mermaiden Tales book that moms will love to read to their little mers as they snuggle up with their new Fergus the Seal plush toy!